Posted in Misc and tagged Beast from the East, bread at 12:02 pm on February 27, 2018 by Bodger. Tasty processed pillows of goodness. All bread heads welcome, maaaan. Aye. But McCambridge’s is great if you’re diabetic. Here andy, what did you do to brother b? I’m assuming you know because you’ve inadvertently become his keeper. My money’s on the restraining order having kicked in. He is of course missed for his wit and general serenading of dear andy, and I hope he comes back with a nice colour. Remember he was keeping an excel spreadsheet of facts about me? He worked it out and found me. Which was, dare I say it, a mistake. I’ll say no more. Well, I will. I nailed his head to a coffee table. Or maybe he’s gone orf to Bayodali. (Vallodalid, that is, but I’m so good at Spanish that it sounds like that when you read it). 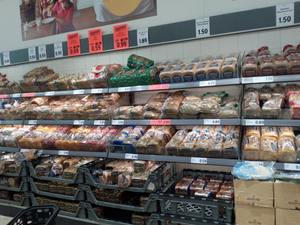 Lots of bread on the shelves. Concern and Trocaire won’t be needed so.